Are You Doing These 5 Things to Get the Most Out of Your Toddler’s Sleep? Just when you figure out solutions to your baby’s sleep problems, she becomes a toddler with all new sleep problems and, very often, she still has some old ones, too! The same strategies that may have worked as a baby (or didn’t), may not work now that she is a toddler or getting out of bed. Common trouble spots are transitioning to one nap, getting your toddler to sleep later in the morning, “needing” you to sit with her while she falls asleep, night wakings (still! ), insomnia, transitioning from co-sleeping or crib to bed, night terrors, and nightmares, just to name a few. Not all children outgrow their sleep problems. 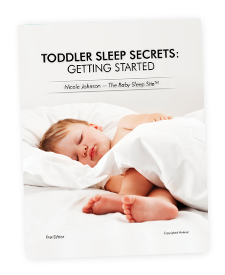 To learn 5 ways to help your toddler sleep and obtain your free toddler sleep e-Book, Toddler Sleep Secrets: Getting Started, please enter your e-mail address below. It’s instantly download-able and there is no obligation. Disclaimer: Individual results will vary. All children are unique and there is no silver bullet (we wish there was!). Some parents go on to need more help than the free guide provides, but you are under NO obligation to purchase additional materials or services. This e-Book is a good start to solving your toddler’s sleep problems and there is no cost involved to give it a try. Join over 450,000 parents & sign up today to receive the guide and weekly Baby Sleep Newsletter absolutely FREE!